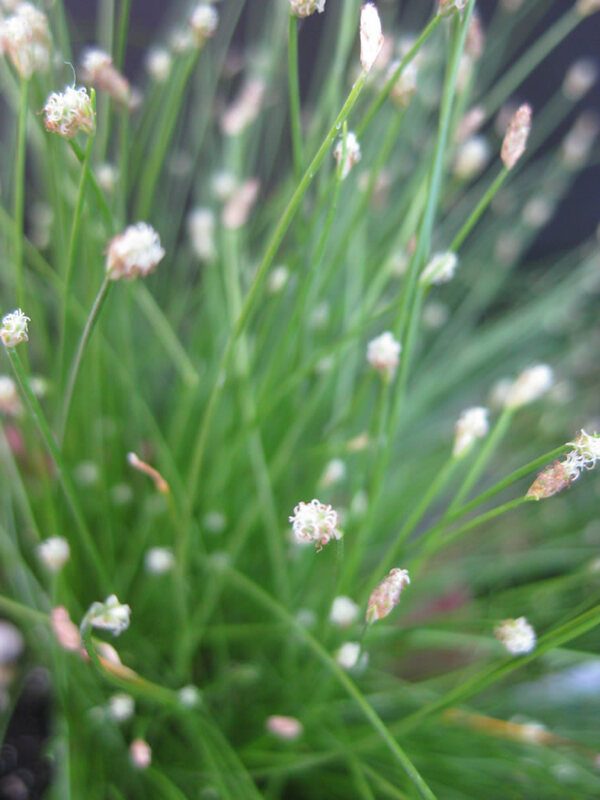 Distribution and habitat: Isolepis cernua is a species of flowering plant in the sedge family and it is widespread, being native to many regions of the world, including parts of Australasia, Eurasia, Africa, and North and South America. It occurs in fresh to brackish, seasonally waterlogged waterways including creek banks, swamps, floodways, seeps, clay pans and lake edges. It is found on most soil types. 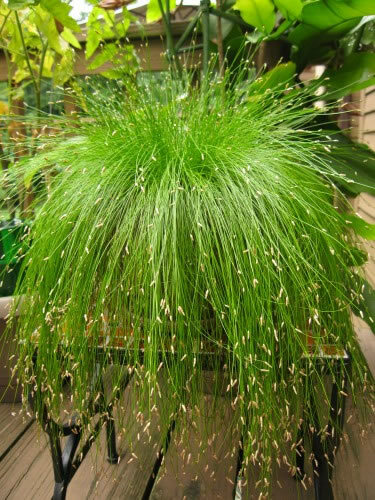 Description: Isolepis cernua is a graceful, grass-like plant that produces dense tufts of tread-like, fresh green leaves arising directly from a creeping underground rootstock. The cylindrical leaves which reseamble stems, grow about 25cm (10 inch) long and each carries at its tip a white to cream coloured flower no bigger than a pin head. Flowers can appear at any time. Although not particularly interesting in themselves, they provide an attractive contrast to the slim, green line of the leaves. New leaves stand erect at fist, but they begin to arch downward as they age. For this reason Isolepis cernua plants show to best advantage when they have been planted in hanging baskets. 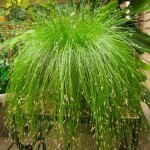 Houseplant care: Isolepis cernua is as an evergreen perennial plant when is grown indoors. Light: Place Isolepis cernua plants in medium light. Unlike most indoor plants, they thrive in a position at a south facing window or even at a window that is obstructed by a nearby construction. Temperature: Normal room temperatures are suitable. These plants, however, will grow actively all year long in temperatures above 13°C (55°F). They can tolerate lower winter temperatures (down to about 7°C (45°F)) but should be given a rest if indoor temperatures are likely to remain unusually low for more than two or three days. Watering: During the active growth period (which may be continuous) water plentifully as often as necessary so as to keep the potting mixture thoroughly and constantly moist. Pots may even be permitted to stand in water. If Isolepis cernua plants are grown in hanging baskets, extra care have to be taken as the plants will dry very quickly; they may need a daily soaking in a bucket of water during the active growing period. If temperatures fall below 12°C (54°F) at any time, it is important to encourage these plants to take a rest period by watering very sparingly, giving only enough to keep the potting mixture from drying out completely. Feeding: Apply standard liquid fertiliser to actively growing plants about once every four weeks. Potting and repotting: Use a soil based potting mixture. Move Isolepis cernua plants into slightly larger pots or hanging baskets whenever the tufted growths completely cover the surface of the mixture. 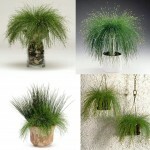 Pots bigger than 13cm (5 inch) should not be necessary , since young plants are more attractive than old ones. Split up any clump that has reached the 13cm (5 inch) size pot and use the resulting pieces for propagation. 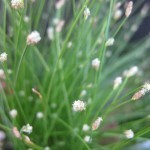 Gardening: Isolepis cernua is not really a grass, but a sedge which thrives with low maintenance and is very decorative. It is a tender perennial (zones 8-11) generally grown as an annual in cold climates, but it can be kept as a houseplant in a sunny window or greenhouse over the winter. Bring it indoors before freezing temperatures occur and set the pot in a shallow tray of water. The fading flowers can be removed to maintain the look of the plant and limit its self-seeding. All wandering stems may be cut to control plant growth. Cut back yearly in spring for fresh new growth. Position: Isolepis cernua thrives in shady position outdoor. Soil: Any moderately fertile soil (clay, loamy, sandy) which is moisture retentive. It can be planted on the water’s edge or in the shallows of ponds, positioned so that the water level is no more than 5cm (2 inch) above the soil. Irrigation: Keep Isolepis cernua in consistently moist soil and keep it moist all year. Will tolerate be planted in water up to 10cm (4 inch). If used this plant in a water garden, gradually increase the water level it sits in unless it is purchased from an aquatic plants display. This will allow the roots to become accustomed to being submerged. 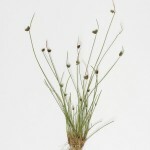 Fertilisation: Isolepis cernua benefits from fertiliser during the growing season. Use a liquid fertiliser every two weeks during the active growing season. Propagation: Propagate Isolepis cernua plants by dividing overcrowded clumps, preferably in the spring. Pull the clumps apart gently, making sure that each section retain at least 20 leaves. Plant the section either in 8cm (3 inch) pots or group three or four together in a single hanging basket and treat them immediately in exactly the same way as mature plants. 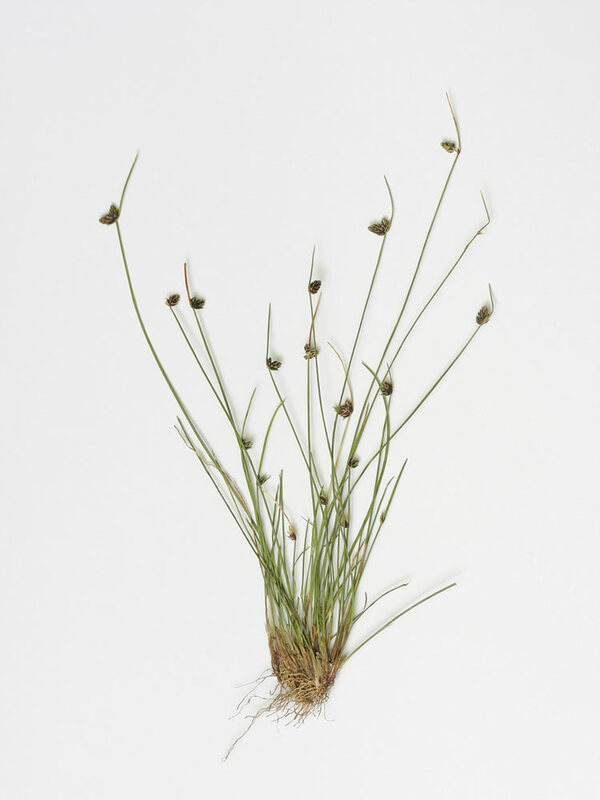 Isolepis cernua can also be propagated by seed. Sow seed in spring, barely covering the seeds. Keep the soil warm at around 21°C (70°F) and constantly moist. Plants companions: In a water garden it combines well with Equisetum species (horsetails), Cyperus prolifer (dwarf papyrus) and Canna species (cannas) (but it best to keep each in separate pots). Toxicity: Both the plant and seeds are poisonous if eaten. Keep it away from children and pets if there is any chance they may play with or ingest them. Handling this plant may cause skin irritation. 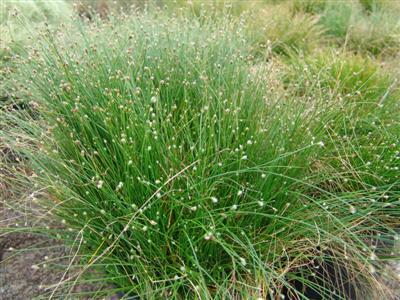 Uses and display: Growing in a clumping mound, Isolepis cernua spills over the sides of a container as it grows, making it ideal for a tall planter or even a hanging pot. Eye-catching on its own, this decorative grass also adds texture among a display of foliage and flowering plants. It can be used as ground cover, as waterside plant being a low maintenance plant for bog garden. It is great for pots, especially hanging baskets to highlight its fountain-like foliage.